The first thing I did when Alpha 2 was released was make a spider using the terraforming tools, and since then I have been turning it into a Nemesis-style inverted coaster. 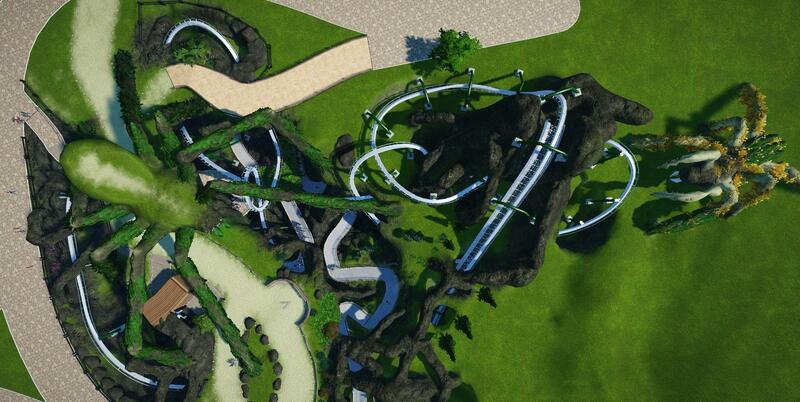 Very Cool, Love terrain Coaster, so the station is also underground? And this shot shows where the station is. The people in the middle of the shot are queuing, the people on the right are exiting the ride. I haven't done any theming on the underground sections yet. I've now tweaked the coaster layout quite a bit. I originally wanted some more inversions but couldn't make them in the new editor, but after much messing about I was finally now able to get the hang of making custom inversions. I also noticed that my original layout was almost entirely right turns, so the new layout breaks that up a bit. I had to delete a lot of my scenery and destroy some terrain to modify the track but it shouldn't take long to decorate again. Seems you had a lot of fun with the terrain tool and the result looks great. I've been making slow steady progress. 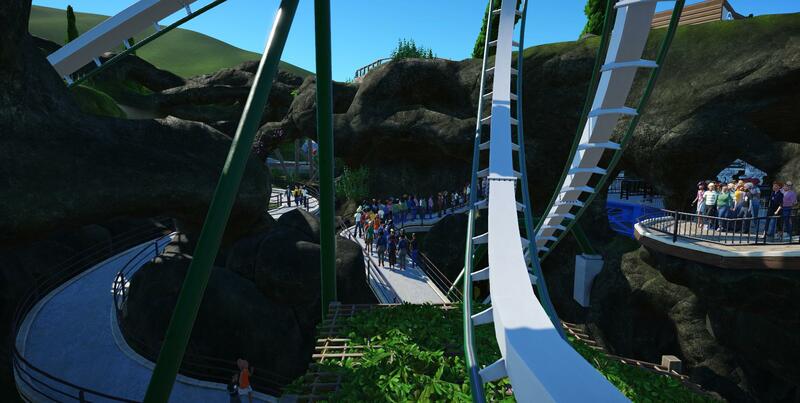 I had to rebuild lots of parts where i'd tweaked the coaster. There is still one section of track which isn't smooth and some missing supports but I need to delete lots of scenery before I can fix it! Question! In that last picture, how did you get that spider design on the rock?! This is more than nice. This is the best themed coaster I've seen so far. Looks absolutely amazing. Very well done. Today I've been working on the queue line, which is entirely undeneath the coaster. The idea here is that you are entering the spider's lair to board the ride. Other than the protective grills (and the coaster!) there are very few man-made objects, it is all nature. lovely theming. cant wait to see a POV of this! I must agree with everyone else. A POV is a must!!! This is amazing!